We have a found and developt an elegant solution to stop the plastic pollution from entering our oceans: Bubbles. The Great Bubble Barrier addresses the problem of plastic pollution in our oceans, by focusing on the source: our canals, rivers and channels. Extensive testing in Deltares facilities, has shown that our idea works. Our first full-scale test in the IJssel, in cooperation with Rijkswaterstaat, was successful. Now, we’ll tackle the canals and rivers in your area. Too much human waste is dumped in our waterways and it brings great harm to the environment and human beings. Aquatic animals and fish get tangled in plastic, ships suffer damages and microplastics pose a health risk from the smallest to largest of organisms. This problem is increasingly seen and recognized by municipalities across the European Union. hinders passing ships and marine life in the river. migration in the Netherlands. Both ships as fish can pass a curtain of air, but plastic will be stopped: this is the principle of the Great Bubble Barrier. We create a bubble screen by pumping air through a tube with holes located on the bottom of the waterway. This upward flow of the bubble barrier brings waste to the surface of the water. 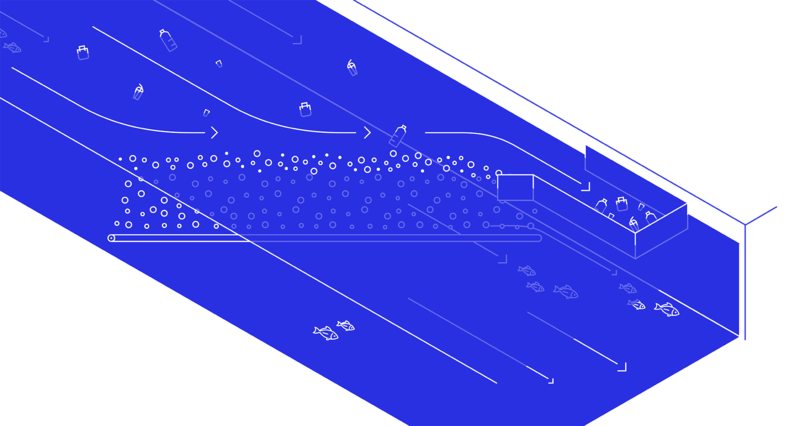 When placed diagonally, the natural current is used to guide the plastic on the riverside, which makes it accessible for collection and accessible removal. Guides plastic to the side of rivers and canals. With these features, our system meets the most important conditions: it has little effect on shipping, fishing and the natural functioning of the delta. The Great Bubble Barrier is based on existing technology, which is used in the oil industry and for separating fresh and salt water, it is easy to apply. Our design can be used in both the largest rivers and smaller canals and channels. Our goal is to place The Great Bubble Barrier in smart locations so that we can stop plastic pollution in rivers at its source and keep plastic out of the oceans. 1. Clean-up of the plastic pollution in rivers and canals with our Bubble Barriers to prevent plastic pollution in our rivers and oceans. 2. Research and monitoring plastic pollution in rivers to collect data about plastic debris and the source. 3. Increase awareness about plastic pollution to prevent plastic waste and litter. 4. Build toward a circular plastic chain to create a shift from a linear to a circular economy in which plastics never become waste. Is this something for your location? The Great Bubble Barrier offers solutions for different problems. The Great Bubble Barrier catches more plastic than current solutions in flowing water because we can reach plastic ( > 1mm ) in the total width and depth of a river. A Bubble Barrier can be placed both in big rivers as in small canals. Now, municipalities and water management boards can tackle this plastic problems in their waters. They have a sustainable solution for their responsibility to keep the water quality up to standards. Ports and canals can be kept clean. In addition, municipalities and water management boards save on patrol boats to collect the debris, for example, and the costs of cleaning up waste after flooding. Drinking water companies ensure that their drinking water sources remain free of plastic particles. The removal of smaller plastic later in the drinking water chain is not yet feasible at the moment, so it is crucial to prevent plastic in the sources. Nature parks can also place a barrier to prevent plastic pollution in nature reserves. In addition, the Bubble Barrier has other positive side effects due to air input. Oxygen levels within the water increases by a Bubble Barrier, which stimulates the ecosystem and stops the growth of the toxic blue algae. Fish and shores will experience less harm from the shipping that sails through our waters because the bubble screens absorb part of the sound and waves. In collaboration with Rijkswaterstaat, Deltares and BAM / van den Herik, this concept has been extensively tested and proved successful. New insights came when testing the concept in the flumes at Deltares in May 2017. At the end of 2017, we realized a Bubble Barrier of 200 meters at Kampen in the IJssel. For three weeks, our research team proved that the Bubble Barrier works under all conditions, with particular attention to the effect of wind and current on the Bubble Barrier and can catch on average 86% of all used test material. Bellenschermen maken slim gebruik van bestaande rivierstromingen. Geen overwachte aanpassingen in aangelegde infrastructuur of beleid nodig. Alleen materialen in gebruik die geen schade brengen aan mensen en dieren. We all contribute to the problem, whether we know it or not. Let’s all contribute to the solution. With your donation, we can get plastic our of the water, before it reaches the seas. Fill in our contact form if you want to get in contact with us if you are interested in applying our solution to create waste-free rivers and canals. Hi there! We're using cookies in order to optimize our site. Find out more.